There has been so much media coverage about organic food in the past few years that it's easy to become confused about what exactly the benefits of eating organic are. Some of the confusion arises because there are different criteria when it comes to labelling foods as being organically produced. In this country you're best to look out for products that are labelled by the Soil Association, as this is the main organisation dealing with organic labelling. To be labelled organic, a food must be produced under strict rules and regulations. These relate to the use of fertilisers and pesticides, as well as issues relating to sustainable production. Organic food is more than just what you choose in the supermarket; it encompasses a whole lifestyle choice in which consumers take greater control of how, where and under what conditions the food they eat is produced. It encourages the production and sales of locally grown produce and has certainly helped to create the demand for local farmers' markets. As people become more interested in where their food comes from, it's great to be able to buy direct from the suppliers and talk to them about their produce. Many people are put off buying organic food as it is pricier than its non-organic counterparts. When you're a student, it's particularly hard to justify an increase in your spending budget and you might decide that you can't afford to make the changeover to organic. However, rather than just dismiss organic shopping outright, how about choosing a few key products that you really enjoy? 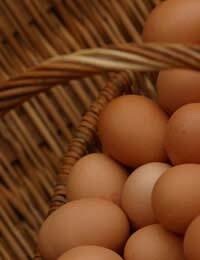 Eggs are a good example of an organic product that has really taken off. There is definitely a crossover between concerns with food production and animal welfare and free range, organic eggs are certainly a good place to start if you're keen to eat a greater amount of organic food. Most people would agree that the taste is far superior as well, so you're paying for both quality and peace of mind. If you don't eat a lot of meat, this is another area in which you might decide to spend a little more for the occasional treat. As animal welfare is another key factor in organic farming, you can enjoy your chops or chicken with a little more peace of mind. With regards to cooking techniques, there are no special skills involved in cooking with organic ingredients. To preserve flavours, you should try and cook the food as soon as possible after purchase and use cooking techniques such as steaming, in order to lock in all those great flavours and vitamins. Good ingredients should be left to speak for themselves, so another idea is to just keep things simple. Grilled organic chicken and some fresh, steamed veggies will be more than enough to enjoy the great flavours of organic produce. Try to buy local, seasonal ingredients wherever possible. If food doesn't have to travel too far, the flavours will be better as you'll get to eat it as soon after it was harvested as possible. Some great examples are British asparagus and new potatoes.